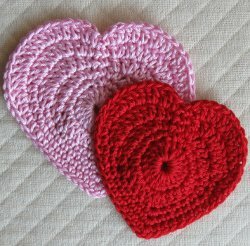 Use this free crochet pattern for a lovely Valentine's gift or decoration. This is a great pattern for a beginner or intermediate crocheter. You can make these lovely hearts and use them as window hangings, coasters, or even as applique accents for an afghan or quilt! Make 2 hearts of the same size and sew them together to make a pocket. Fill with candy, treats, or a note to a loved one and spread the love on Valentine's Day! Small heart measures about 3 1/2 inches tall and about 3 1/2 inches across; larger heart is about 4 inches tall and 4 inches across. Fasten off here for small heart; add one more round, below, for larger heart. Round 6: Ch 1, 1 sc in same st, 2 dcs in next st, 1 dc in next 3 sts, 2 dcs in next st, 1 dc in next 2 sts, 2 dcs in next st, 1 dc in next 3 sts, 2 dcs in next st, 1 hdc in next 4 sts, 1 sc in next 8 sts, 3 scs in next st (tip), 1 sc in next 8 sts, 1 hdc in next 4 sts, 2 dcs in next st, 1 dc in next 3 sts, 2 dcs in next st, 1 dc in next 2 sts, 2 dcs in next st, 1 dc in next 3 sts, 2 dcs in next st, 1 sc in last st, sl st to 1st st (61 sts), fasten off. What a pretty decoration for Valentine's Day. I would pin one onto my purse, one onto my coat, and several onto a scarf. I would scatter them on the table, too. I better get to work I have lots to make! This is perfect for small hearts. There easy to make with the pattern, which is a project for children as well. These crocheted hearts have been made by several generations of my family. I love patterns like this. They are so easy and so versatile . You can put one on top of another and glue them onto a brochure pin for a valentine decoration. Or glue them onto a head band, make a baby mobile out of them. Slip one into the lunch bag of someone special. The possibilities go on and on. Thank you for this heart pattern. I've been making them for coasters using the #10 thread and F needle and using another color for an edging. After adding my edging some of them looked a little too round so I made another pattern so it would look more like a longer heart shape with the definite indent on top. 1. Ch3, sl st into 1st ch to create loop, ch 2, 19 dcs into loop sl st into top of 1st dc, do not turn throughout 2. Ch 1, 2 dc in next 3 st, 1 dc in next st, 1 hdc in next st, 2 sc in next st, 1 sc in next 3 st, 3 sc in next st (creates bottom tip of heart), 1 sc in next 3 st, 2 sc in next st, 1 hdc in next st, 1dc in next st, 2 dc in next 3 st, sl st in next st. (29 sts) 3. 1 sc in next 2 st, 1 hdc in next st, 2 dc in next 3 st, 1 hdc in next st, sc in next 7 st, 3 sc in next st (should be in middle sc of 3-sc tip of row before), sc in next 7 st, 1 hdc in next st, 2 dc in next 3 st, 1 hdc in next st, 1 sc in next 2 st, sl st in ch 1 st. (37 sts) 4. Sl st in next st, sc in next st, hdc in next st, 2 dc in next 5 st, hdc in next st, sc in next 10 st, 3 sc in next st (again should be in tip), sc in next 10 st, hdc in next st, 2 dc in next 5 st, hdc in next st, sc in next st, sl st in last st(49 sts) 5. Sl st in next st, sc in next st, hdc in next st, 2 dc in next 7 st, 1 dc in next 14 st, dc tr dc in next st (again should be in tip), 1 dc in next 14 st, 2 dc in next 7 st, hdc in next st, sc in next st, sl st in next st. (63 sts) Edging is start at V of heart, insert thread, ch1 and sc in first st, (sc dc sc in next st, sc in next st) repeat around and end with sc, leaving 2 st open between beginning and end, join with first sc. I love the Pink and Red heart pattern but I would like to make it bigger. I have not been able to get the flow to go past row 6. Please help. This is lovely. I have made almost the same - like a purse - and keep it in my car to have change for the parking. Never be without change any more. AND! NOBADY KNOWS THAT THERE ARE MONEY IN IT! It is like a little gift hanging on the button near the gearstick. Just love it. Thank you for a lovely patterns that you are given to us "FREE!" I like this pattern. Wish there was a symbol chart of it. I'm gonna look up the magic circle thing, because somewhere around rows-2/3 the heart forms the shape of a cup. I blocked it, I remade it with a larger (5.0mm) hook (that turned out the best), I used DK instead of worsted yarn, but I can't get it flat. I love these and can't figure out what I am doing wrong. Maybe cotton yarn is the problem. But they're cute and I'm not giving up. What is the "magic circle" jsgilbert 1936979 mentions? I made 20 of these for my Silver Belles lunch group, and another 2 dozen or so for neighbors & etc. I added a crystal bead to the center of each one & used variegated pink yarn. Also made a big one, w/crystal beads around it, backed it with felt and filled it with potpourri, with an added hanging string-as a car deodorizer! I made several each night while watching TV - quick & easy craft! Great pattern -- much better than what I have as more tru heart shaped! I used the magic circle though instead of chain and then didn't have the hole in the middle. This is nice as gift tags, too or to attach with a gift tag. Easy to do. LOVE this! Started and finished in about 30 min! We are going to give these as coasters to friends this year since they were so quick n easy. I used multi colored cotton yarn so it is absorbent and looks tie dyed! Thank you!!! This is an easier pattern than the one that I have. I think I'll use this one from now on. They make great Valentine's Day "Cards" too. Last year I made different colored hearts, took embroidery thread and made them look like the candy hearts that come in the boxes, and gave them to some of my closest family and friends. They were a big hit. This pattern will make it so much easier, thank you! I made one heart using cotton yarn and another using nylon net and stitched them together to make a Valentine's scrubbie. It turned out really cute! 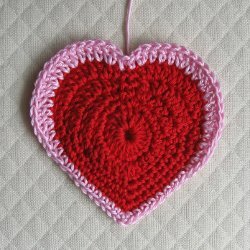 I enjoyed making this Valentine's heart pattern. I made it out of red worsted wool and made it into a necklace for a small child. I attached a chain by crocheting a chain - approx. 24 in. long. Thanks again for this pattern. Great idea! I bet it would be a cute hair accessory, too. Thanks for sharing. Thanks, very pretty. This one's a keeper!